You can customize your location's office hours to show on the schedule when the office is closed and when appointments can be scheduled. If you attempt to schedule an appointment outside of the specified hours, a message will appear for you to confirm that you want to schedule that appointment outside of normal business hours. Any time ranges already set up appear in a list. To add a new time range, click (or tap) Add Hours. To modify one of the default time ranges, select that time range. The options for entering or editing the time range become available. 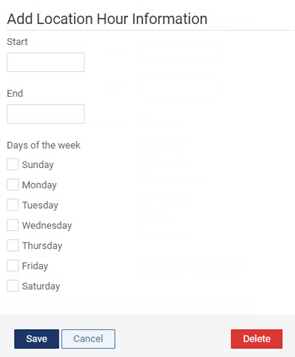 Type a time range, and select the appropriate days of the week. Repeat steps 2 - 4 for other time ranges that you want to modify or add. When viewing the overview of the weekly schedule on the Location Hours page, gray slots indicate when the office is closed, and white slots indicate when the office is open.